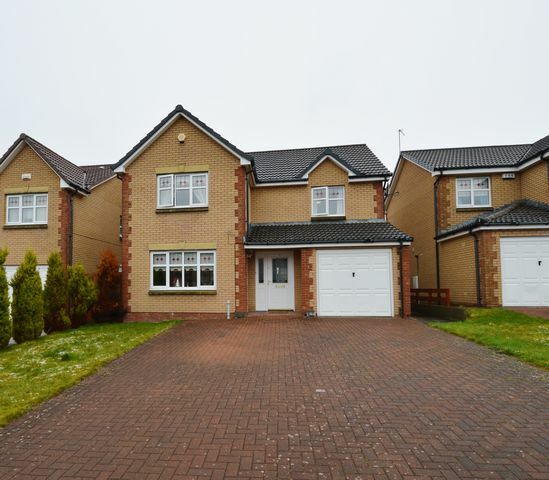 Fabulous detached family home in Glasgow's Cambuslang. This modern detached villa is offered as a wonderful family home with spacious accommodation and private garden. The property is well presented internally, with neutral décor throughout. It comprises light entrance hall, spacious living room with double doors through to formal dining room with french doors to the rear garden, great dining kitchen ,separate utility, downstairs cloakroom/WC. Upstairs has spacious master bedroom with fitted wardrobes and en-suite shower room, 2 double bedrooms ( with fitted wardrobes) and one single bedroom. Family bathroom. Storage Cupboard. Attic. The property has a driveway with space for 2 cars. GCH. Double glazing throughout. The house further benefits from a private enclosed rear garden which has an attractive patio area and is lawned with shrubbery, ideal for children. Situated in The Drumsagard Village estate, this is a quiet residential estate which has great access to the new M77 motorway offering access into Glasgow or East Kilbride in around 15 minute. Newton or Cambuslang train station offers direct access into Glasgow in 10 minutes via park and ride.